Another Christmas has come and gone, and three new board and card games were left in my stocking. None have hit the table yet, but I figured it was worth a post to present my pre-play thoughts. 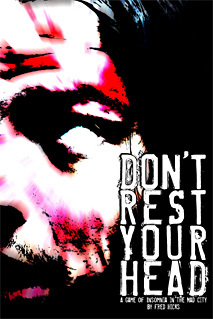 Don’t Rest Your Head is a role-playing game designed by Fred Hicks and published by the imprint Hicks shares with Rob Donaghue and Leonard Balsera, Evil Hat Productions. The subtitle, A Game of Insomnia in the Mad City, is about as good a one sentence summary of the game as I can imagine. Fred held a one-day sale on the pdf version of the game, making it available for US$5 on Halloween. For reasons I will explain shortly, I had been interested in the DRYH since shortly after it came out. Really, it was only a matter of time before I bought it, but the sale was too good to pass up, so I grabbed it. I didn’t get a chance to sit down and read it for a couple of weeks, and this is the first time I’ve had to write up my initial impressions.